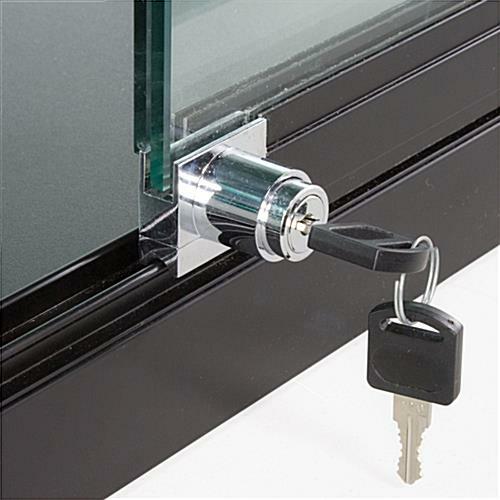 Sliding, locking doors provide added security! Ships pre-assembled to save time! (2) 20-watt halogen top lights illuminate displayed items! 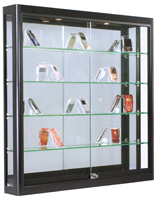 This wall display case is a great choice for your store or service-oriented business. The wall case is crafted from durable and long-lasting anodized aluminum to withstand years of use in busy retail environments. 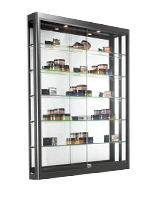 The wall display case, also known as a glass showcase, is a great way to take advantage of wall space. 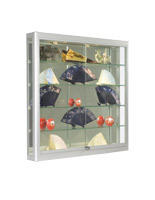 By hanging this display case on a wall, you are opening up valuable floor space for larger products that can not be hung on a wall, or easing the flow of traffic through your store. 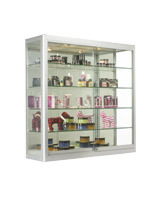 A wall display case is also perfect for utilizing space that is normally unusable, such as behind register stands or counters. 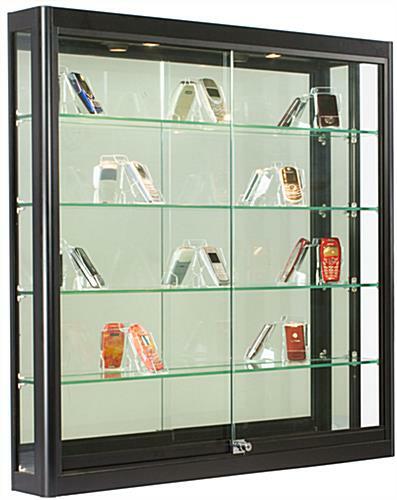 The glass showcase, wall display case can be used to hold anything from jewelry, to eyewear, sports memorabilia, trophies, or electronics. 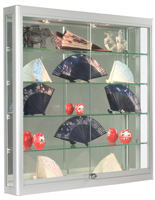 This wall display case is well-equipped with essential features. The case offers a full-vision view of products, with tempered glass doors and sides, and a mirror back to offer a full 360-degree view of products, as well. The wall display features four fully-adjustable, full length shelves, secured by rubber-padded shelf clips. 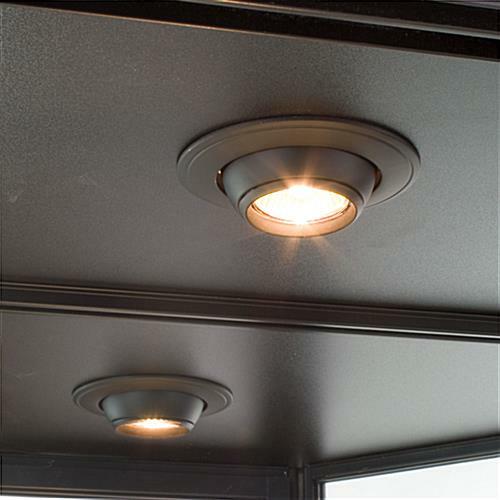 Two halogen top lights can easily be turned on or off with the easy-to-reach light switch, located on the inner right-hand corner of the wall display case. 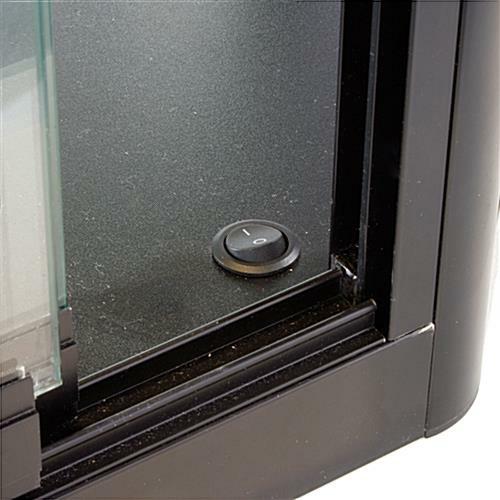 The sliding doors feature a plunger lock to prevent unauthorized access to items within the wall display case. 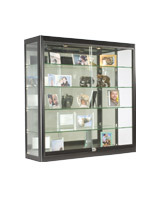 This case mounts on your store wall with two heavy-duty z-bar mounts (on top and bottom of case). All hardware and Mounting Instructions. Please Note: The product has a corded plug and cannot be hardwired. Arrived as promised. Has not been installed and know it will perform as promised.